It seems common for MacBookPros2018 overheating when connected to external display (see other info about the general problem here, or here). Despite there is no risk for HW, it's quite uncomfortable for who works on them. I noticed that if I connect my MBP to an external display when it runs with battery, it does not get (so) hot. I suppose that the MBP uses another configuration of its graphics framework when it is not connected to power adapter. Therefore, I hypothesize that if it used the same graphics configuration when it's plugged to the power, then the overheating would be reduced. Is there a way to make the MPB use the same graphics configuration for external displays also when it is connected to the power? The 2018 15" MacBook Pros all have dual-GPUs. The AMD GPU is required to be active when an external screen is connected. There is no way to use the internal (Intel) GPU for external screens. Fan noise is one of the main nuisances of the recent MacBook Pros in my opinion. When I get too frustrated, I sometimes use Turbo Boost Switcher, which helps a bit. Volta is a similar App, but does not seem to work with 2018 MacBooks. Both Apps deactivate the CPU's Turbo Boost mode, which means less speed, but also less power consumption and less noise. Update: I forgot to mention AppTamer; another tool which often saves me some noise. Is there a way to make the MPB use the same graphics configuration for external displays also when it is connected to the power? ...I noticed that if I connect my MBP to an external display when it runs with battery, it does not get (so) hot. No. Your MacBook's processor uses Intel SpeedStep technology (including the current 8th gen models) that reduces power when connected to battery to slow things down to increase battery life. This is why it's less hot. When you connect an external monitor it will use the discrete GPU, so there's no getting around that; this can't be reconfigured. (IMO), Apple has reached the threshold of where it can take function following form. Because of this, I have modified my behavior and expectations of what their "mobile workstations" (aka MacBook Pros) are capable of delivering. I personally use an Air, old Pro, or a plain MacBook and off load my heavy lifting to the cloud. The fan system is the thing that goes in a curve on the picture. Not the answer you're looking for? 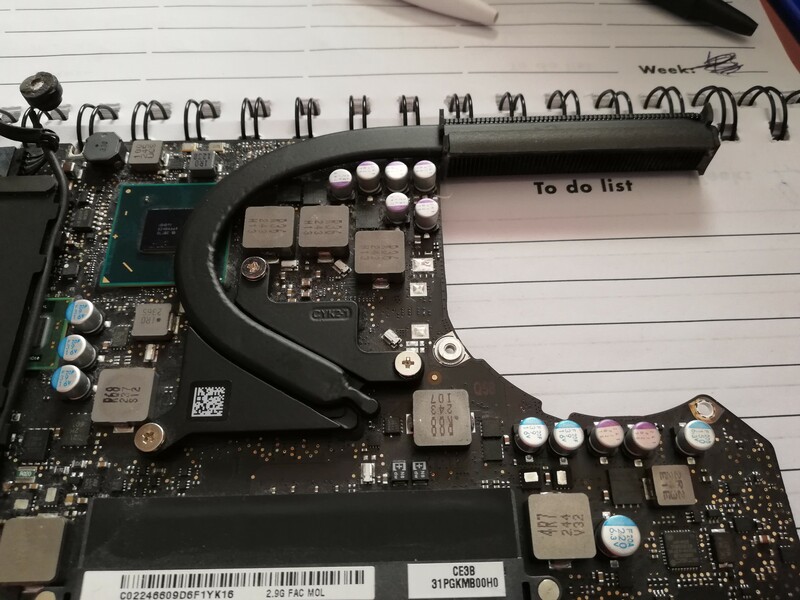 Browse other questions tagged macbook graphics temperature . How do I enable the laptop display at boot when an external display is connected?